I started to write this to tell the story of Easter, the biblical story not the actual meaning of Easter, which is the based around the coming of spring and other Pagan stories. But I became sidetracked (like I always do) with all the contradictions of the New Testament. So before I get to Easter I want to give my standard boilerplate warning about reading the bible. I want to point out, as I have been reading the different accounts of Jesus’ Crucifixion and Resurrection, in Matthew, Mark, Luke and John that these books differ greatly and they probably contain little if any real facts. Be careful not to fall into the same trap that many Christians do, assuming that the four Gospels are in any sense a historical record. Their multiple authors, none of whom published anything until many decades after the Crucifixion of Jesus, cannot agree on anything of importance. Matthew and Luke cannot concur on the Virgin Birth or the genealogy of Jesus. They completely contradict each other on the "Flight into Egypt," Matthew saying that Joseph was "warned in a dream" to make an immediate escape and Luke saying that all three stayed in Bethlehem until Mary's "purification according to the laws of Moses," which would make it forty days, and then went back to Nazareth via Jerusalem. The Gospel according to Luke states that the miraculous birth occurred in a year when the Emperor Caesar Augustus ordered a census for the purpose of taxation, and that this happened at a time when Herod reigned in Judaea and Quirinius was governor of Syria. That is the closest to a triangulation of historical dating that any biblical writer even attempts. But Herod died four years "BC," and during his ruler ship the governor of Syria was not Quirinius. There is no mention of any Augustan census by any Roman historian, but the Jewish chronicler Josephus mentions one that did occur—without the onerous requirement for people to return to their places of birth, and six years after the birth of Jesus is supposed to have taken place. This is, all of it, quite evidently a garbled and oral-based reconstruction undertaken some considerable time after the "fact." The scribes cannot even agree on the mythical elements: they disagree wildly about the Sermon on the Mount, the anointing of Jesus, the treachery of Judas, and Peter's haunting "denial." Most astonishingly, they cannot converge on a common account of the Crucifixion or the Resurrection. Thus, the one interpretation that we simply have to discard is the one that claims divine warrant for all four of them. In the December 2004 issue of Free Inquiry, Tom Flynn, the Editor of that excellent magazine, assembled a collection of articles documenting the contradictions and gaping holes in the well-loved Christmas story. Flynn himself lists the many contradictions between Matthew and Luke, the only two evangelists who treat the birth of Jesus at all. Robert Gillooly shows how all the essential features of the Jesus legend, including the star in the east, the virgin birth, the veneration of the baby by kings, the miracles, the execution, the resurrection and the ascension are borrowed – every last one of them - from other religions already in existence in the Mediterranean and Near East region. Flynn suggests that Matthew's desire to fulfill messianic prophecies (descent from David, birth in Bethlehem) for the benefit of Jewish readers came into headlong collision with Luke's desire to adapt Christianity for the Gentiles, and hence to press the familiar hot buttons of pagan Hellenistic religions (virgin birth, worship by kings, etc.). The resulting contradictions are glaring, but consistently overlooked by the faithful. Richard Dawkins says it best when he writes; sophisticated Christians do not need anyone to convince them that the things that you read in the Bible aren't necessarily true. But there are many unsophisticated Christians out there who think it absolutely is necessarily so, people who take the Bible very seriously indeed as a literal and accurate record of history and hence as evidence supporting their religious beliefs. Do these people never open the book that they believe is the literal truth? Why don't they notice those glaring contradictions? Shouldn't a literalist worry about the fact that Matthew traces Joseph's descent from King David via twenty-eight intermediate generations, while Luke has forty-one generations? Worse, there is almost no overlap in the names on the two lists! In any case, if Jesus really was born of a virgin, Joseph's ancestry is irrelevant and cannot be used to fulfil, on Jesus' behalf, the Old Testament prophecy that the Messiah should be descended from David. The American biblical scholar Bart Ehrman, in a book whose subtitle is The Story Behind Who Changed the New Testament and Why, unfolds the huge uncertainty befogging the New Testament texts. Never the less, here are the resurrection stories from Matthew, Mark, Luke, and John. I bolded some of the inconsistencies and interesting points. 26 And after eight days again his disciples were within, and Thomas with them:then came Jesus, the doors being shut, and stood in the midst, and said, Peace be unto you. 27 Then saith he to Thomas, Reach hither thy finger, and behold my hands; and reach hither thy hand, andthrust it into my side: and be not faithless, but believing. All these ‘resurrections’ undermine the uniqueness of the resurrection by which all of mankind’s sins were forgiven. There is no cult or religion before or since, from Osiris to vampirism to voodoo, that does not rely on some innate belief in the "undead." For now though, we can say that resurrection would not prove the truth of Jesus’ doctrine, nor his paternity, nor the probability of still another return in fleshly or recognisable form. The action of a man who volunteers to die for his fellow creatures is universally regarded as noble. The extra claim not to have "really" died, because he was back in three days, makes the whole sacrifice tricky and meretricious. Thus, those who say "Christ died for my sins," when he did not really "die" at all, are making a statement that is false in its own terms. Having no reliable or consistent witnesses, in anything like the time period needed to certify such an extraordinary claim, we are finally entitled to say that we have a right, if not an obligation, to respect ourselves enough to disbelieve the whole thing, unless or until superior evidence is presented, which it has not been. Exceptional claims demand exceptional evidence! Miracles in any case do not vindicate the truth of the religion that practices them: Aaron supposedly vanquished Pharoah's magicians in an open competition but did not deny that they could perform wonders as well. However, there has not been a claimed resurrection for some time and no shaman who purports to do it has ever agreed to reproduce his trick in such a way as to stand a challenge. Thus we must ask ourselves: Has the art of resurrection died out? Or are we relying on dubious sources? There is no need for us to gather every day, or every seven days, or on any high and auspicious day, to proclaim our rectitude or to grovel and wallow in our unworthiness. We atheists do not require any priests, or any hierarchy above them, to police our doctrine. Sacrifices and ceremonies are abhorrent to us, as are relics and the worship of any images or objects (even including objects in the form of one of man's most useful innovations: the bound book). To us no spot on earth is or could be "holier" than another: to the ostentatious absurdity of the pilgrimage, or the plain horror of killing civilians in the name of some sacred wall or cave or shrine or rock! The nineteenth century is the last time when it was possible for an educated person to admit to believing in miracles like the virgin birth without embarrassment. When pressed, many educated Christians today are too loyal to deny the virgin birth and the resurrection. But it embarrasses them because their rational minds know it is absurd, so they would much rather not be asked. 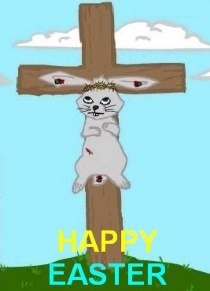 Have a good Easter. If you’re with your family, enjoy them, but don’t focus on a barbaric murder and an improbable resurrection.